Welcome to Shamrock Chapel & Belle Vue. We offer a beautiful, tranquil setting with magnificent views of the Sundays River Valley and Zuurberg mountains. We are located on a working citrus farm on the R336 between Kirkwood & Addo in the Eastern Cape, South Africa. With easy access to Port Elizabeth and the airport, as well as the Addo National Elephant Park on our doorstep, we’ve become a popular destination venue. 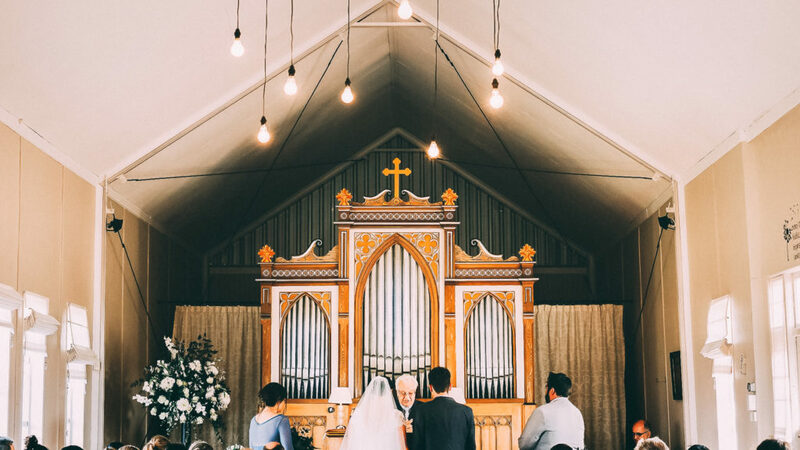 It all started in 2012 when a homestead had to be demolished when it became irreparable, and it was decided to use all salvaged materials to build a chapel, perched on top of a hill and overlooking our farm and orchards, aptly named ‘Geluk’, meaning happiness. We later took ownership of the historical Lauterbach pipe organ that was previously doing service in the Lutheran Church in Wartburg, Kwa-Zulu Natal, for more than 100 years, and which we restored ourselves. This is the oldest South African built pipe organ in South Africa and has heritage status. On a Saturday of spring 2015, a couple came to have a look at the chapel for their wedding, and they insisted that they wanted to have their reception on the farm in a Bedouin tent. We tried to discourage them because of all the logistical issues, but later that afternoon they drove away from the farm, the deal made and wedding date booked. There was one condition: “We don’t do porta-potties”. When we got back from our annual leave in January, we decided to start construction of the bathroom, but the project soon started to get a life, and a will, of its own. On May, 1st 2015, Mark & Michelle had their wedding in our new venue, Belle Vue. We both have extensive experience in the hospitality industry, and making and seeing people happy during one of the most special days of their lives, is for us a tremendous incentive to keep on bettering ourselves, our venues and service. We offer an exclusive, one-stop service for couples, tailoring, planning and executing their wedding day or function to make it an extraordinary event.